Virtually nothing happened in the garden this month. Two doses of the Beast from the East plus a fair amount of rain and wind meant we were for the most part housebound. And there’s only so much lounging, dozing, shilly-shallying and pottering one can do before stir-craziness sets in. So, while watching the snow fall, my scanning machine and I went to work, digitally converting hundreds of negatives onto my iMac. 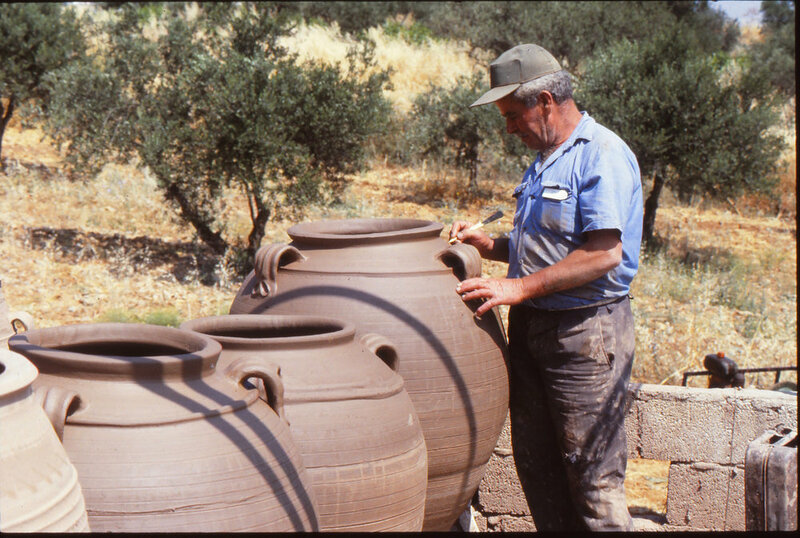 Mostly the pictures were taken in Crete and many were of the potteries we dealt with during our time running Pots and Pithoi, so today, instead of wittering on about matters horticultural, I’ll tell you how those wonderful pots are made. 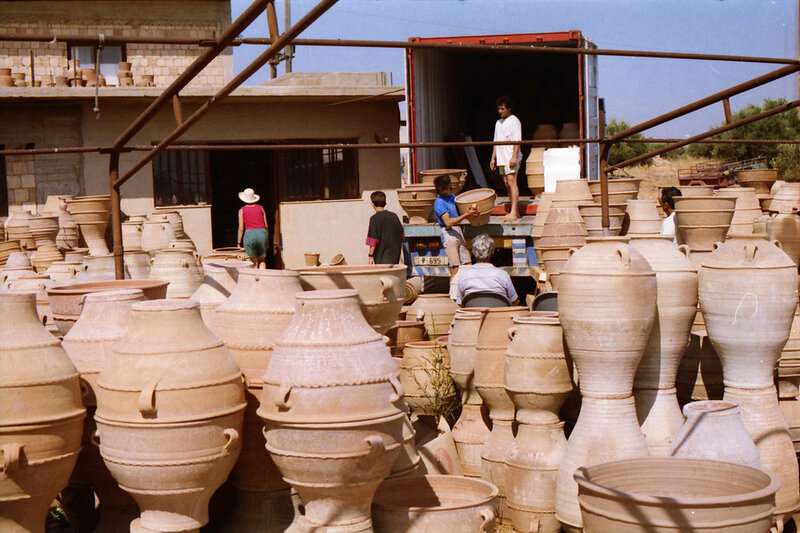 There are small potteries in several villages on Crete but Thrapsano, south of Heraklion, is the real centre of pot-making. Pots have been made here for centuries and almost nothing has changed in the way they’re made. 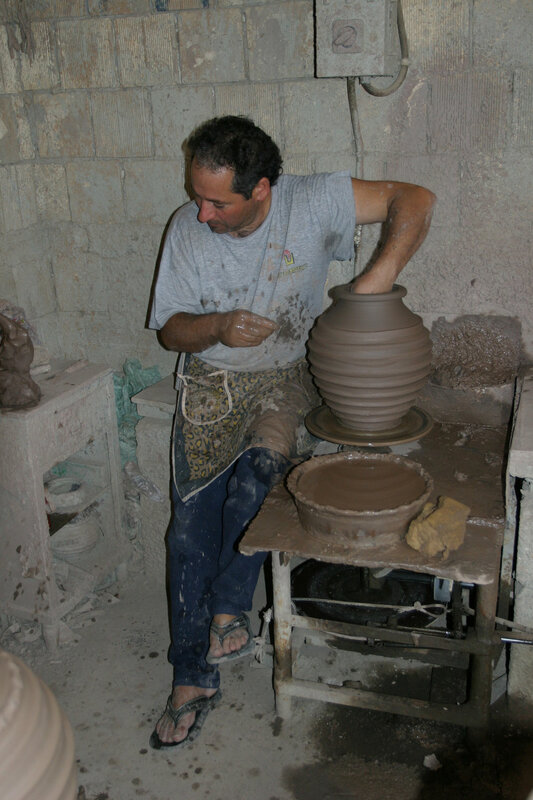 Local clay is laboriously sifted and mixed with clay from a couple of other Cretan villages and then hand thrown on three different sorts of potter’s wheels: the kick-wheel and the electric wheel (a modern invention) for the smaller pots and the hand-turned wheel for the larger ones. Apart from the very smallest all the pots are built up in stages, a few inches at a time. Once the first layer of clay has been thrown it is allowed to harden sufficiently before another sausage of clay is added and thrown until the whole pot is, layer by layer, and in the case of the big pots, wheel by wheel, complete. Once the body of the pot has been finished the handles and decorations are added, either by scraping the clay with bits of wood or metal, or by adding bands of clay and prodding with their fingers and thumbs to produce a pattern. Then the sun dries them until they are handleable and ready to be lifted into the kiln. The kiln is fired, initially with sawdust and olive pips, with the main fuel being grape pips which because of the oil within the pips, produces a heat of around 1100 degrees centigrade. This ensures that the pots are as tough as old boots and as frost proof as any terracotta pots can ever be. After around 24 hours of this fierce heat a huge flame engulfs the inside of the kiln and scorches the pots to give each one its own individual ‘antique’ look. Once the firing is complete and the temperature inside the kiln matches the outside, the pots are unloaded and left to cool. Then they are filled with water (the impurities in the water ‘sealing’ the pot to give it extra strength) and left for a further 24 hours. Only then are they truly finished and ready, when we were Pots and Pithoi, to be loaded into 40 foot containers and brought to the UK. If you’re interested Pots and Pithoi is still going strong, now into its third owner, David Dodd. Have a look at their website: www.potsandpithoi.com . As for me, I’m all scanned out …time for a snooze. Newer PostHow we met Bob and Bob.